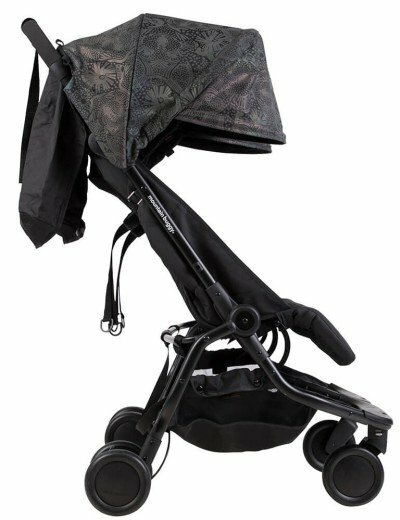 Mountain Buggy has just released new double lightweight umbrella stroller, designed for parents of twins and two babies of similar age. Brand new Mountain Buggy Nano Duo 2018 is already on the market and I can’t wait to tell you more about it! The single Mountain Buggy Nano is one of the most popular lightweight stroller, especially as it offers seating configuration for newborn baby. Now you can have its functions and quality in a double version. Nano Duo weighs only 20 lbs which is extremely little as for a double stroller. This portable and compact double lightweight stroller is perfect choice for parents who are often out and about with their children. Running errands, strolling around the city, traveling – Mountain Buggy Nano Duo 2018 makes it much easier and enjoyable. Double lightweight stroller 20 lbs 33 lbs per seat Great stroller for city use or travel with kids, suitable for twins and children of similar age. 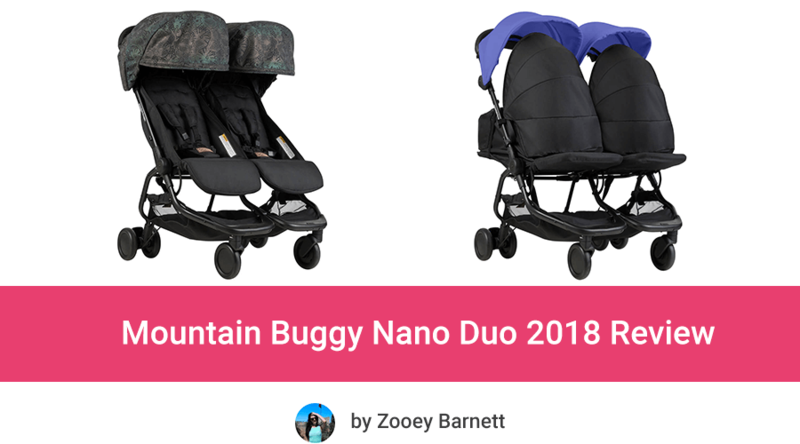 What other parents think about Mountain Buggy Nano Duo 2018? It is a double version of the iconic Mountain Buggy Nano. Let’s take a look at its features and see how is double Nano performance. 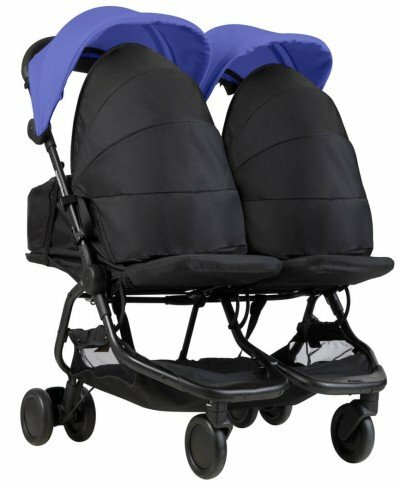 Mountain Buggy Nano Duo 2018 offers few seating options – for newborn twins, for an infant and toddler and for two toddlers. Nano Duo has two regular toddler seats that are suitable from about 6 months – when the baby can sit unassisted – up to about 3 years. The weight capacity is 33 lbs for each seat. The max. head height is 26″ so the seats are suitable also for taller toddlers. You can recline each seat independently by using a straps with a buckle on the seat back. The recline is not flat, but it should be deep enough for babies who like to nap during strolls. Moreover the seats have vented tops made of mesh. On hot summer days you can use them for additional air-flow. When it’s colder, you can easily cover them with fabric extension overlay. 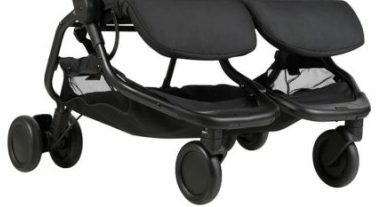 I like that double Nano stroller has individually adjustable calf rests – just like the single version of Nano. Each seat has good amount of padding to provide comfortable ride for the babies. There is also an adjustable 5-point harness for each passenger. Just like the single version, Mountain Buggy Nano Duo offers solution for newborns. You can attach one or two cocoons to make this stroller suitable from birth. Thanks to this function you can use Nano Duo as a lightweight stroller for newborn twins or for an infant and toddler. 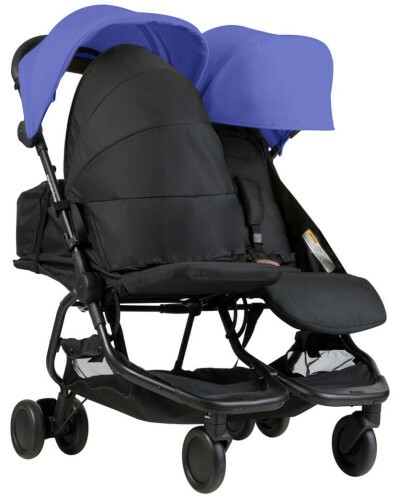 Keep in mind that without Newborn Cocoons this stroller cannot be used for newborns or infants who lack head and neck control because the regular seats don’t recline fully flat. Only the cocoon provides proper flat position and support for newborns delicate spine. 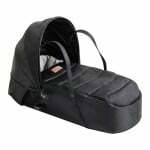 Mountain Buggy Newborn Cocoon is sold separately. 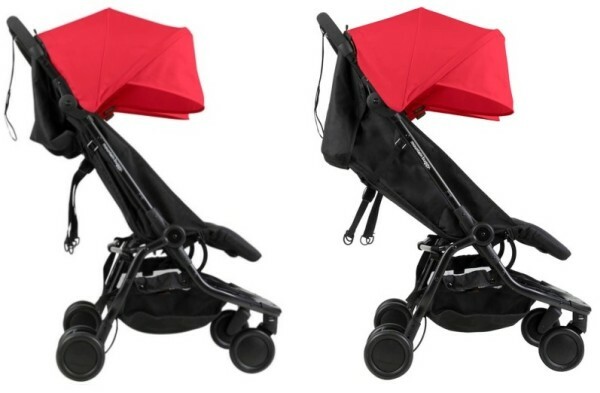 Mountain Buggy Nano Duo has two independently adjustable canopies with 3 panels. I wish these hoods were a bit bigger, nevertheless they do block the sun out of children eyes. There is however one drawback, that some parents have already notice. Double Nano doesn’t have the peek-a-boo windows – just like the single Nano. It’s a pity that the brand didn’t improve the canopy, especially since many parents complain about the lack of peek-a-boo window on single Nano. Double version of Mountain Buggy Nano has single front wheel design and dual rear wheel design. Front wheels swivel to make the stroller more nimble and easy to operate. You can also lock them for greater stability. The wheels are only 4″ so they are definitely not suitable for rough terrain or bumps. They are designed for even surfaces like sidewalks and indoor use (at the mall and airport). However there is suspension built into the rear wheels which absorb some shocks and cushions the ride a little bit. Moreover Nano Duo offers great weight distribution and allows to lift the front wheels easily and overcome obstacles or curbs. Nano Duo has single action brake. The pedal has color coded parts for engaging and releasing the brake. I would prefer bigger pedal, but this one is also fairly easy to use. Just like the single Nano, Nano Duo doesn’t have adjustable handlebar either. 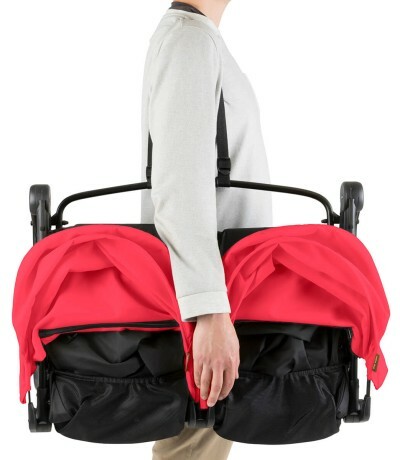 Its fixed height will be convenient for short and parents, however very tall person with long legs with be pushing the stroller while walking very close to it. It may lead to kicking the rear axle. The basket underneath the seats is quite spacious and can easily accommodate large diaper bag. The weight capacity is 17.6 lbs which is definitely enough for essentials for a day trip. Although the basket is quite big, the access is not very easy as there are some bars that may make taking larger items in and out a bit more difficult. This stroller is not only lightweight, but also quite compact. It is 28.7″ wide so it fits through normal doorways and elevators without any problems. The best part is the Nano Duo weight. 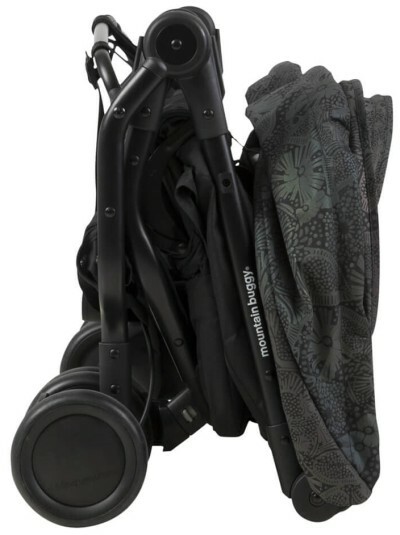 This stroller weighs only 20 lbs – which makes it a great double lightweight umbrella stroller. It’s even lighter than many single standard strollers! Mountain Buggy Nano Duo 2018 folds in two steps and it requires using two hands, but it is fairly quick and easy. 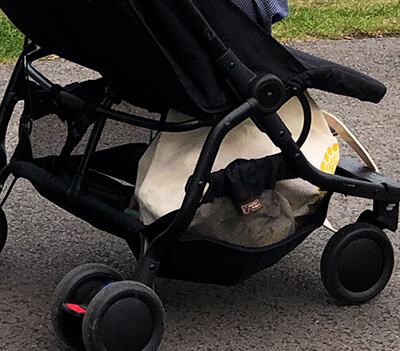 The stroller stands on its own when folded and the wheels do not touch the seat fabric or the canopy which is great because the whole fabric stays clean during storing or transportation. Nano Duo features carry handle and shoulder strap. And since the stroller is so lightweight, it’s easy even to carry up and down the stairs. 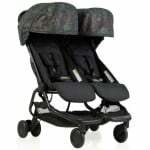 Folded Mountain Buggy Nano Duo doesn’t take up so much space like other double stroller. Its folded dimensions are: 20″ x 28.7″ x 11″. With such a flat fold it is much easier to store at home or in car trunk. I always check what other customers wrote about the baby products I’m about to buy. This stroller has been released on the market just recently and last time I checked it on Amazon it didn’t have any reviews yet, but I’m sure it will check soon. I will let you know what parents say about Nano Duo when it receives first reviews. The new Mountain Buggy Nano Duo comes in 6 colors: Cyber (yellow), Silver, Ruby, Nautical, Black and Year of Dog (special edition for 2018 model). All colors may not be always available for sale and they may have different price. If you are thinking about buying this stroller check if your favorite color version is currently available and how much it costs. 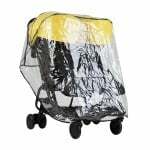 Nano Duo Storm Cover – This shield protects babies from wind, rain and snow. It’s a useful accessory for parents who live in area where it rains often. I always keep the rain shield in the storage basket, just in case. 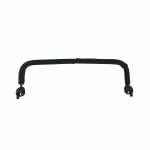 Nano Duo Grab Bar – You can also add a double belly bar so the babies have something to hold on to during the stroll. It is also an additional safety feature that protects babies from sliding down or falling out. Newborn Cocoon – If you want to use Mountain Buggy Nano Duo for one of two newborn babies you need to add this cocoon. It provides fully flat position and good support for infant back and head. 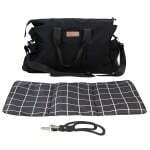 Double Satchel – This diaper bag can be attached to Mountain Buggy Nano Duo handlebar. There are many internal and external pockets were parents can keep their necessities and valuables and always have them at hand. The 4-inches wheels are not suitable for off-road or rough terrain. They work best on flat even ground. To make this stroller suitable for newborns, you will have to pay extra for the cocoons. 1. 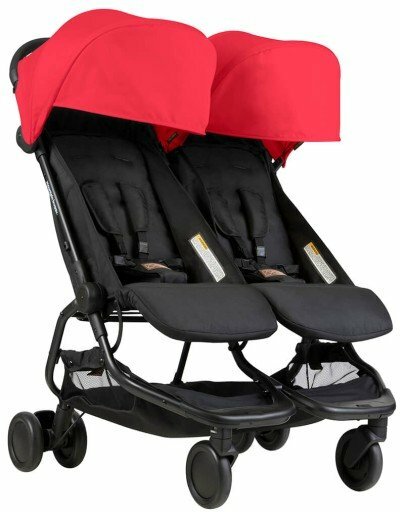 This is one of the lightest double strollers that are currently available on the market. 2. It is suitable not only for toddlers, but you can use it from birth when you add the cocoons. Now you have a lightweight stroller for newborn babies! This can be your only stroller. 3. to store and transport, therefore this stroller is great choice for those who have small apartment or small car. Do you like Mountain Buggy Nano Duo and consider purchasing it? Before you do it, make sure this stroller suits your needs. It’s not cheap so don’t forget to check if there are any available discounts. If this stroller is not what you need, check out my ranking of the best double strollers. Are you able to attach a car seat to this? Hi Abbi! No, this stroller is not compatible with car seats. For newborn baby you can only attach a special cocoon (it looks like a small bassinet). i can take it in the airplane or its to big ? I ordered this twin buggy and returned it straight away. I didn’t find if user friendly in the slightest. The hood material when pulled right back rests on your hands which are on the handles bar, it’s so annoying! The hood either pulls right back or right toward there is no inbetween. The storage is not generous at all shallow and not useful. It felt very out of proportion with its long seats and short stumpy wheels. It didn’t cope well with anything but flat terrain. Its compact but tricky to fold and I’m sorry but you cannot do it one handed like they claim. It felt heavy when carried with the strap but then its a twin buggy it’s never going to be easy to carry! Im used to a super slim tandem so this felt very wide to me I had to keep checking the sides to see if I was going to bang in to doorways and walls when I manoeuvre it around. I bought direct from MB without realising returns were at your own expense and not free so I was left out of pocket for something I didn’t even want. Pretty poor customer service if you ask me. This buggy has definitely not swayed me from my Joie tandem. And you’re right – it’s hard to get used to a side-by-side stroller if you have been using a narrow tandem. Nano Double is quite compact when folded when it is double so you need to be extra careful when carrying it. Did you purchase any other stroller or did you stay with Joie?